Greece, the country that gave the world democracy, is still making headlines when it comes to politics. Especially today as the Eurozone deals with this unprecedented win for the far-left, vehemently anti-austerity, Syriza. The Economist has dubbed it ‘the euro’s next crisis’. Crisis or not, it looks set to catapult Greece and the entire Eurozone into a period of economic, and political, uncertainty. The euro momentarily hit an eleven year low this morning as results began to flood in from all over the country making it clear there was a win for this new party. So, what does this mean for expats living in Greece? Alexis Tsipras, sworn in as new Greek prime minister today after dramatic win. It will have been difficult to avoid the austere cuts for anyone in Greece over the past few years, however following the election there is definitely a feeling of hopeful defiance among the Greek people. In the long term it is difficult to predict what may come to pass with regards to the economy, yet a break from austerity may be welcomed for the mood of the country in general, as it will give it a welcome respite. Syriza’s plans for social reform (e.g. national healthcare, accessible to all), if enacted, can only be a good thing for the country’s less advantaged. 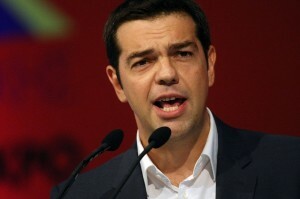 February is a crucial month for Greece, as a decision on an extension on its bailout is required. The EU summit on the 12th should make Greece’s position in the Eurozone clearer and alleviate panic which may have been caused amongst investors and those less keen on a far-left government. What does it mean for the rest of the EU? The consequences of this win are not only going to be felt in Greece, yet all around the EU. Certainly, Spain’s ideologically aligned Podemos is looking on hopefully as this bodes well for new party politics and in the coming general election in Spain later in the year. If Syriza is successful, this could create a domino effect and hail a new era of populist parties throughout Europe. The parties, whether left or right leaning, tend to be, on the whole, anti-euro, thus potentially marking the beginning of the end for the single currency. European politicians have already voiced concerns over the future of Greece and its place within the Eurozone, UK chancellor George Osborne has called Syriza’s pre-election pledges into question, claiming that they are incompatible with what the Eurozone expects of its members. The waiting game has now begun in order to see whether or not Syriza is the answer to Greece’s economic woes or whether it will embroil them further into debt and depression. It may seem illogical and unlikely that an exit (or Grexit) from the euro will occur, yet this should prepare us to sometimes expect the unexpected. Next story Singapore is having a birthday party and everyone is invited!